If you are a machine operator, you’re aware of the inherent risk of your vehicle tipping over and causing a serious injury or death. A potential killer that you might not be aware of is carbon monoxide (CO) emissions from driving a fuel-powered machine indoors. You, along with welders, marine terminal workers, garage mechanics and carbon-black makers are among the professions most likely to be exposed to carbon monoxide dangers. How hazardous are CO emissions? The U.S. Occupational Health & Safety Administration (OSHA) requires awareness of the potential dangers posed by carbon monoxide poisoning. OSHA recently published a special online resource dealing exclusively with carbon monoxide dangers, and this tool is used as a supplement to regular OSHA forklift and aerial lift training requirements. What Is CO and Where Does It Come From? Carbon monoxide is colorless, odorless and tasteless, which makes it hard to know if you are being exposed to it. It is often mixed with gases that you can smell, which means you may be breathing it right along with stuff you are familiar with and not even know it. The gas is often the product of incomplete combustion of natural gas and other carbon-containing materials such as gasoline, kerosene, propane, wood, coal or diesel fuel. The U.S. Environmental Protection Agency considers carbon monoxide one of the most lethal gases, and a definite “hidden danger” in the workplace. CO awareness is very important for forklift drivers, aerial lift operators, scissor lift personnel, and many other jobs. Here are just some of the enclosed and hazardous areas that OSHA has identified. Exercise extra caution in the following areas to prevent carbon monoxide poisoning. Remember: common sense always wins out! Carbon monoxide dangers do not go away simply because an indoor area is well ventilated. If your work area has problems with the HVAC system, or the air circulation equipment hasn’t been serviced in a while, it’s still possible to get carbon monoxide poisoning. Even “half inside – half outside” regions contain carbon monoxide dangers. Why Is Carbon Monoxide Harmful? Once inhaled, CO binds tightly to hemoglobin circulating in the bloodstream, displacing oxygen and depriving the heart, brain, and other organs in the process. Exposure to large amounts of CO can overwhelm you within minutes, causing you to pass out and suffocate. If you are lucky, before you lose consciousness you may feel tightness in the chest, dizziness, headache, drowsiness, nausea, and fatigue. These are exactly the same symptoms you will experience if you are coming down with a cold or flu. How Can You Avoid Carbon Monoxide Poisoning? 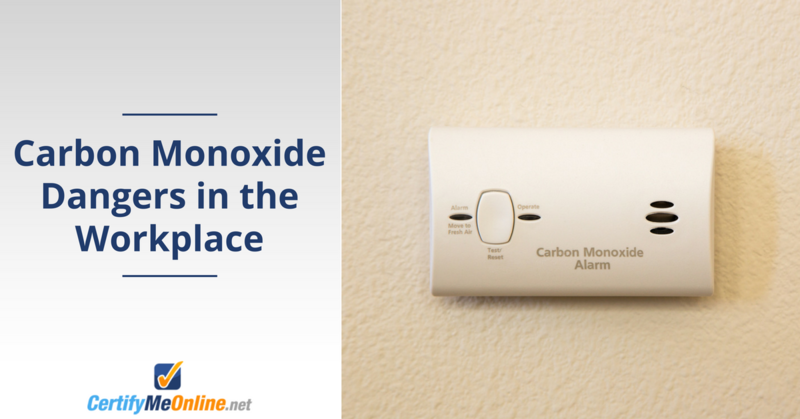 The dangers of carbon monoxide can’t be underestimated. Every year, according to the U.S. Centers for Disease Control and Prevention (CDC), there are hundreds of carbon monoxide poisoning deaths. Many of these occur in the workplace. – Shut down any idling internal combustion engine in an enclosed area. – Work with caution in smaller work areas or other spaces where carbon monoxide gases can collect. – Keep up to date with your work area’s ventilation system – make sure all ducts, blowers, etc. are regularly serviced. – Watch out for cold weather – closed doors and other concealed areas to keep out the weather is the perfect environment for carbon monoxide dangers to increase. – Pay attention to the signs and symptoms of carbon monoxide poisoning (see above). The good thing about CO poisoning is that it is reversible as soon as you start breathing oxygen. Unless your rescuers also pass out from exposure, they will rush you into an area where you will receive fresh air. They may administer pure oxygen. Eventually, you may be placed into what is called a hyperbaric chamber, where you will receive pure oxygen under pressure. Know the Dangers of Carbon Monoxide Poisoning – Get Certified with CMO Today! – Training content for aerial lift operation developed by OSHA experts. – Affordable pricing – CMO training modules are less expensive than the competition. – Easy renewal training – we offer 3-year renewal training for the ultimate in cost savings and convenience! – Complete aerial lift and scissor lift certification – with CMO, all your training needs are in one place. This entry was posted in Aerial Lift Training on December 3, 2013 by admin.